If you have purchased GoDaddy hosting plan then you might have received free Workspace email along with it. It is a free email address which you receive along with your GoDaddy hosting plan. You can create that free email at your domain name address. The problem here is that when you create this free email, by default, the “from” field for that email is the email address which you have created. This looks very unprofessional, especially when you are handling and replying to queries which you have received on that email address. It is very important for your reader or customer to know that who is the real person at the back end. So lets see how you can change it to your first and last name or something else which you may like. Step 1: Login to your GoDaddy workspace email using your login credentials. Step 2: Change the look to classic view by using the option from the top right as shown in the image below. 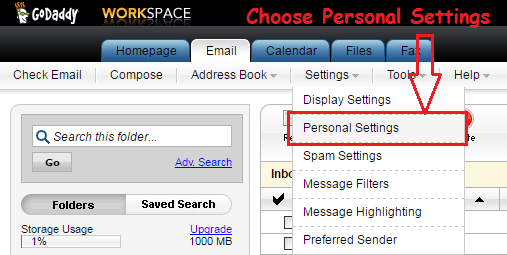 Step 3: Choose personal setting from the settings drop down menu as shown in the image below. Step 4: From the personal settings choose identities. 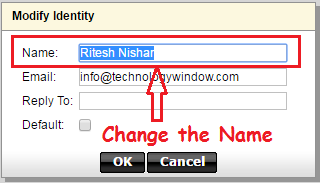 Step 5: Click on edit button against the email address for which you want to change the display name. Step 6: In the pop-up window, change the “Name” field to your first and last name or whatever else that you want to put and click OK. This is how you can change the display name of GoDaddy Workspace email. If you are using email in Office 365 from GoDaddy then its a different method there. In that case you need to go to options from the settings gear icon. Once you have opened that, just edit the display name in account section using edit information option. If you have any questions regarding to this then feel free to ask via comments section below.